eight weeks of my kitten's life?" Kitten growth obviously starts in the queen's womb ("queen" is the word for an unspayed female kitty, especially when talking about pregnant females). Newborn kittens normally weigh between two and four ounces (57 to 114 grams) when they're born. They should add about a half an ounce (15 grams) a day. The newborns are blind and deaf and they can barely move more than a couple of inches to start. 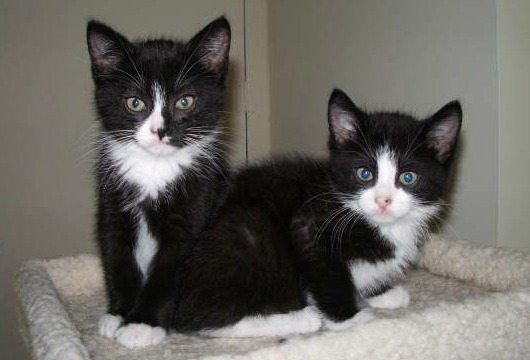 Kittens are virtually helpless at birth and proper newborn kitten care is essential. You're momma cat will do most of the work, but your assistance may also be required if things go awry. At this point, kittens start to open their eyes. It'll take about two to three days for them to fully open up. Long-haired cats may need a couple more days to open their eyes. Interestingly, all kittens have blue eyes. Baby kittens start to smell and hear, and their ears, which were previously folded and flat against their head, will now become erect. 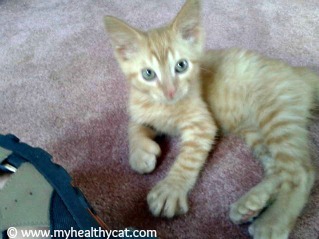 (They start to look like real mini healthy cats!) Their eye color may start to change from blue to their permanent color (although this usually happens at around 12 weeks; and in some breeds, it may take up to a year to fully develop their adult eye color). Their teeth also start to grow through. The little tykes start to purr at around three weeks old. It's so yummy! Kittens know where to find food! The kittens start to become more mobile, although they are unsteady on their feet and tend to fall over a lot. If they stray too far away from their kittening box, the mother cat will carry them back. Until four weeks of age, they are pretty much dependent on their mom. At this stage of kitten growth and development, the baby kittens' tails start to become more animated. At four weeks, they can be weaned from their cat mom and fed a premium quality cat food. Following their mother's lead, kittens start to groom themselves at about five weeks. They'll also start to groom each other. So cute! This is the age at which you should start to train the baby kittens to use the litter box. Make sure the edge of the box isn't too high for them to jump into. Kittens start to become more playful and adventurous at this stage. Yay! At this age, kittens can normally eat, groom themselves and use the litter box on their own. This is the earliest age at which they can leave their cat mom and be adopted out. It's recommended that pedigree kittens not leave until they're 12 weeks old. 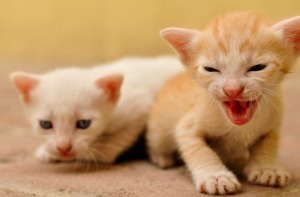 Cats Giving Birth to Kittens - Learn about feline labor, delivery, and what you can do to help your pregnant cat give birth.